I am extremely biased, any answer or comparison I could give would be unfair to some extent. I like to work on unique things, comparing alternatives to what I build infers that what we’re doing has already been done before. That demotivates me. For the same reason I get demotivated when I hear people say that CodeSandbox is like any other online IDE. Saying something like that makes me feel that whatever we build wouldn’t be noticed anyway. That’s why I decided to write down everything that I think are the defining big features of CodeSandbox, features that you cannot find in many other IDEs. This way I can always link to this post when someone asks me the question, without making a direct comparison. A live session right after it was release, now we also added chat and the option to follow people along as they open different files. When working on a sandbox you can open up a Live Session. This generates a unique URL which you can give to others to join your sandbox and collaborate live (google docs style) together with you. As the owner of the sandbox you can also enable ‘Classroom Mode’, this mode allows you to specify who can edit the sandbox and who can only view. This is especially useful for workshops or situations where more than 30 people connect at the same time. Besides importing from and exporting to GitHub we also allow you to work on a GitHub repo directly. When forking a sandbox that’s imported from GitHub you can make changes and either create a PR or a commit with the changes when you’re done. If you don’t own the repository that’s no problem, we automatically fork it for you and create a PR. 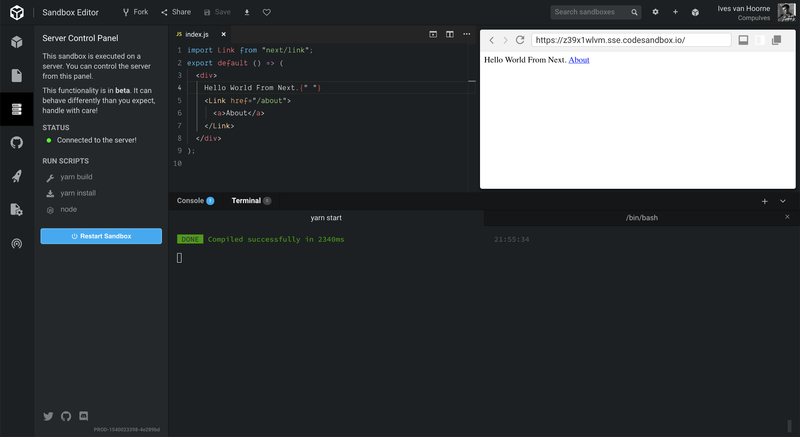 Since recently we have an experimental feature (you can enable it in settings) called ‘VSCode in the browser’. 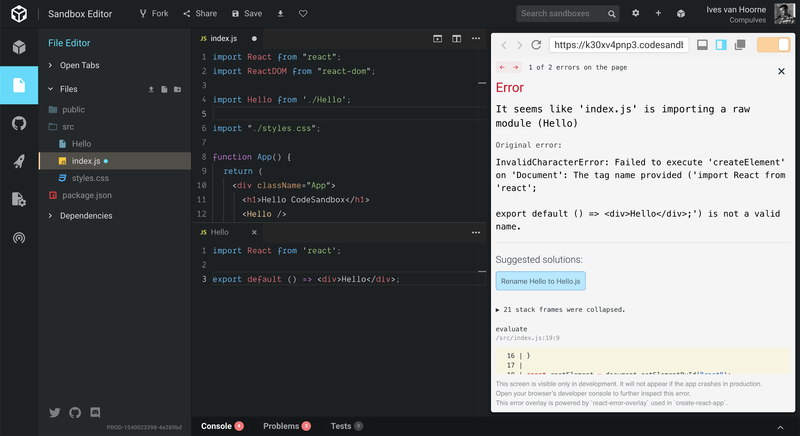 The name really says what it is, we have created a fork of VSCode that works in the browser. Because of this we get Grid View, Keybindings, User Snippets, Breadcrumbs, VSCode Settings and more. You can copy your settings files directly from VSCode to CodeSandbox and we should have the exact same keybindings, snippets and preferences. I want to clear up that this isn’t only Monaco, but also parts of VSCode (like the previously mentioned features) that weren’t ported to the browser yet. This is a Next server running in a CodeSandbox Container, you can run bash, scripts, etc. Another recent addition is Container Sandboxes. Previously we would run a sandbox in the browser. This works great for many sandboxes, but imposes a limitation on what you can run. With Container Sandboxes we actually run the code on a server, this makes it possible to eg. create a Node/GraphQL server on CodeSandbox. 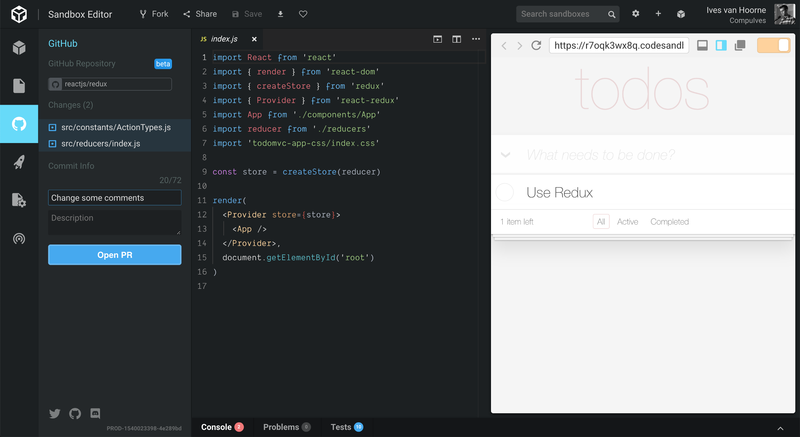 It also opens up the possibility to create Next/Gatsby/Nuxt projects inside CodeSandbox. It runs anything that works locally. Everyone has a dashboard that they can organize their sandboxes in. 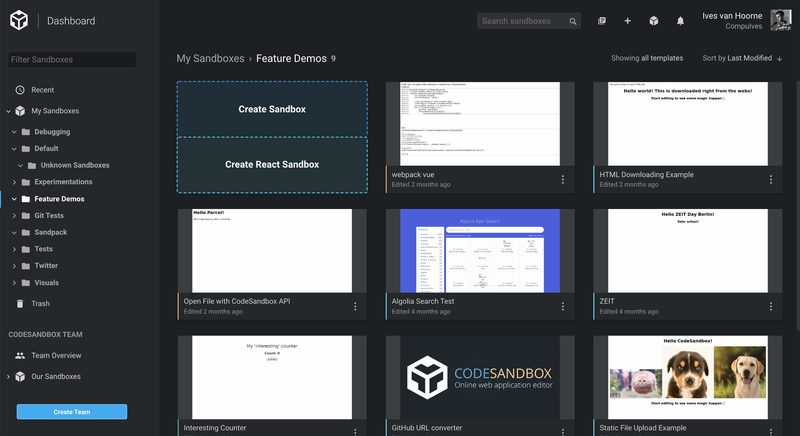 In this dashboard you can create directories (like Google Docs) to categorize your sandboxes. You can also search, filter and sort the sandboxes whenever you need to find a specific sandbox. We show a screenshot of every sandbox so you can visually filter them. Another feature of the dashboard is the option to create teams. As a team you can share ownership of sandboxes and work on them together. There is no limit to team sizes and whenever multiple people from a team open the same sandbox we automatically create a live session. There is a raw import here, we give the suggestion to rename the file. 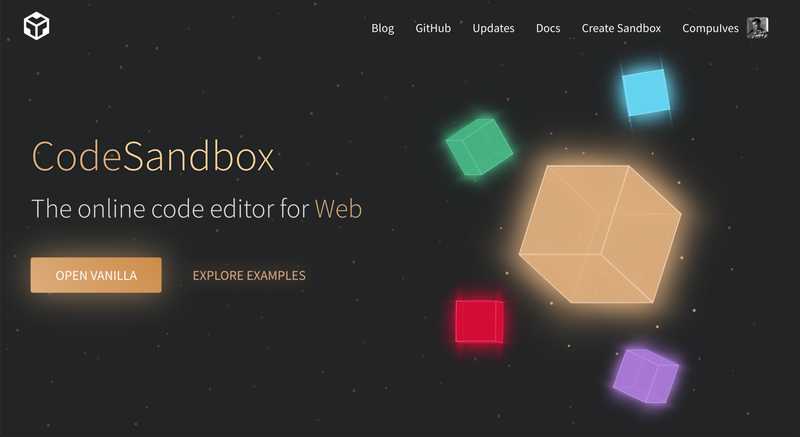 We try to make CodeSandbox useful for people wanting to learn web development. That’s why we show error suggestions for some errors (like ‘Add Missing NPM Dependency’ or ‘Rename “App” to “App.js”’). For known configuration files we show a UI and description. We also have a search page, on this page you can search for sandboxes (850.000 at the time of writing) when you need to find any examples. You can filter on dependency, on template and on tags to make it easier. If you, for example, ever want to know how redux is used you can filter on that dependency and shift through the examples sandboxes. We have a deployment integration with Now. When you want to create a production version of your sandbox you can click ‘Deploy Now’. This will deploy the sandbox, install the node_modules and start it under a new URL. We then give this URL back which you can alias to any domain that you like. We are also adding support for other deployment providers in the near future! These are the features that I think are worth mentioning, but don’t deserve a header of their own. As a Patron you can create sandboxes that are either private (not viewable apart from you/your team) or unlisted (not viewable from search) sandboxes. We have support for running Jest tests and have a small dashboard for it where you can manage the tests and control them. The frontend and the microservices of CodeSandbox are open source! This is the place where you can find out how CodeSandbox works. We currently have 97 contributors and are always welcoming more! This is a list of things that you can do with CodeSandbox, but I don’t think this truly defines us. I think our values, our drive and our ‘out of the box’-thinking is what produced all these features, and will certainly define what we’ll be able to make in the coming years. I really can’t wait to see what the future holds and I’m looking forward to work on this online editor as long as I can. 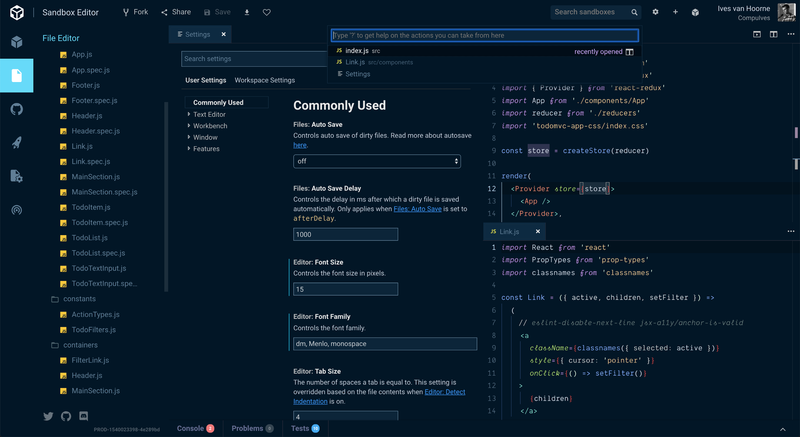 These features are not only built by myself, we now have a big group of people working on CodeSandbox. I want to thank Bas Buursma, Bogdan Luca, Sara Vieira, Christian Alfoni for their work, and also a big thanks to the other 93+ contributors who have added features, documentation and support! If you’re interested in helping us out, this is our repository with the most activity!